Abel Jackson’s sea-fringed life includes diving for abalone, chores around the house and snorkelling with an enormous groper Blueback. 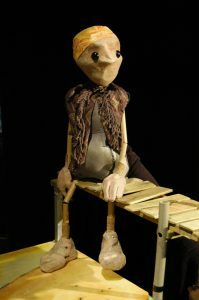 He recounts these events to his dad in questioning letters that underpin Spare Parts Puppet Theatre’s latest show with a meditative, poetic tone. 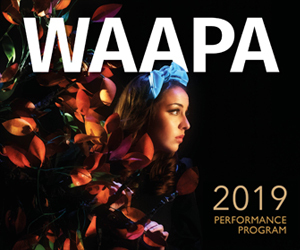 The production is an adaptation of Tim Winton’s Blueback, an evocation of a quintessential West Australian coastline which brims with wildness and quirky characters. There is Abel, who spends the long weeks at boarding school practising holding his breath till his return home to his beloved ocean. There is his resilient mum who holds firm against land-hungry real estate agents and biffs a fish in the nose to deter it from taking the bait of a greedy fisherman. And there is Abel’s absent dad, who we discover is one of a long line of Jackson’s lost at sea in the dangerous whaling industry. The theme of the ocean and humanity’s embryonic connection to it, is explored within a meta narrative of the cycle of life. Aided by the puppets, the story is playful and wistful in turn, expressed best in the relationship between Abel and Blueback which is built with games of hide and seek and moments of eye to eye staring. Don Hopkins’ score is propelled by a bass guitar 80’s groove. But there is a melancholy that pervades this work, perhaps from the lists Abel keeps intoning, and the gnawing absence of his father. The colourful puppets (designed by Hanna Parssinen) include eels, lobsters, bright fish and of course the majestic Blueback, whose graceful and playful nature is captured by puppeteers Jessica Harlond-Kenny and Daniel Dosek. The human puppets are cleverly created using wetsuit material and round driftwood-like heads – part of the constant reiteration of the connection between people and the ocean. Yet for all the poetic melancholy and environmentally compelling themes, this show left little impact on my entourage. The potential for immersing the audience in the story was never fully realised. We wanted to dive in but felt like we were only getting our toes wet. Perhaps there is no substitute for actually heading to the ocean and discovering its mystical qualities for ourselves. Blueback continues until April 27. Read our junior review, by Isabel (age 9) and Eddy (age 6), here. Pictured top: Blueback meets Abel Jackson.